Frostad Atelier Foundry offers weekend workshops taught by Ronnie on basic sculpting techniques. The workshop is held in the foundry, and the attendees are also introduced to the lost wax bronze casting procedure. Ronnie has taught semester sculpting courses at Cosumnes River College in Sacramento, California. The workshop is designed to benefit the novice to the experienced artist. Many of her students have continued in the art world to become accomplished artists with sculptures installed in New York and Pennsylvania. A Power Point lecture on the lost wax bronze casting procedure is presented on Saturday. You will sculpt your own creation in wax under the tutelage of Ronnie on Saturday and Sunday. At the end of the workshop on Sunday, you will leave your sculpture with Ronnie, and her foundry crew will start the bronze casting process beginning with investment. 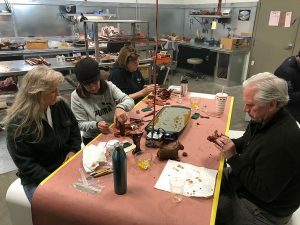 When your sculpture is ready to pour, you will be notified, and you will have the opportunity to witness the actual bonze pour of your sculpture. The foundry will then finish the metal and apply the patina. The fee for the workshop is $500 and includes all necessary supplies and instruments, the casting process, and a continental breakfast on both days. Please call the foundry for more information and to register for the next workshop at (916) 929-5225.